In a Multitasking enabled workspace, all the tasks are assigned to one of the available TaskChannels (Voice, SMS, Chat, Video or Default). When creating a Task you can specify the type of a Task by providing the appropriate TaskChannel Unique Name with the API. Additionally, TaskRouter automatically assigns the appropriate TaskChannel if the Task is created from within one of the Twilio products. For example, if a Task is created from within Programmable Voice using the <Enqueue> verb, then Voice is set as TaskChannel. If no TaskChannel is provided while creating a Task, TaskRouter assigns Default as TaskChannel. In addition to using Task Channel while creating Tasks, you also need to configure the worker’s capacity to handle each of these TaskChannels. For example, you may want a worker to handle a maximum of 1 Voice call, but 3 Chat requests. This configuration can be easily done from within Twilio Console by navigating to each worker instance, or by using the REST API. In addition, you can temporarily make a worker unavailable to handle specific task types without setting their capacity to 0. For example, if your Voice Queue is getting busy, you might want to make some workers unavailable to handle other TaskChannels so that they can focus on handling Voice tasks. Note: Please keep in mind that, in a Multitasking Workspace worker must always remain in an available activity such as Idle so that TaskRouter can assign tasks based on their available capacity for appropriate TaskChannel. In addition, TaskRouter does not automatically change the worker’s activity state when they are reserved with a Task and later accepted the task. At this point based on the worker’s availability, configured capacity and type of Task in TaskQueues, TaskRouter will create reservations for appropriate Tasks for each of the worker. If workers are configured to handle Tasks of multiple different types TaskRouter will continue to create reservations for workers for each channel type that is not at maximum capacity, even if they are busy with one channel. For example, if a worker is currently handling a Voice task and a new Chat Task arrives, TaskRouter will create a reservation for the worker if the worker still has available capacity for Chat TaskChannel. In reality, you may want to block a worker from handling any more Tasks if they are busy with a Voice Task. To address this use case TaskRouter provides the following pre-defined attributes that you can use to write an appropriate Target Worker Expression in a Workflow. This attribute returns the current configured capacity of a worker for an appropriate channel. For example, if a worker’s Chat capacity is configured to 3 and Voice capacity is configured to 1 then, worker.channel.chat.configured_capacity returns 3 and worker.channel.voice.configured_capacity returns 1. This attribute returns the total number of tasks that are assigned to a specific channel for the worker. For example, if the worker is currently handling 2 Chat Tasks and 0 Voice Tasks then, worker.channel.chat.assigned_tasks returns 2 while worker.channel.voice.assigned_tasks returns 0. This attribute returns the appropriate channel’s current available capacity between 0 and 100 for a worker, where 0 means the worker is capped out handling Tasks for the channel and 100 means the worker is fully available to handle Tasks for the channel. For example, if a worker is configured to handle 1 voice Task and three Chat Tasks and is currently assigned to one Voice Task but not assigned to any other Tasks, worker.channel.voice.available_capacity_percentage returns 0 while worker.channel.chat.available_capacity_percentage returns 100. This expression will only route Voice Tasks to Workers who are on one or fewer Chat Tasks. This expression will only route SMS Tasks to Workers who are only 50% busy handling Chat Tasks. 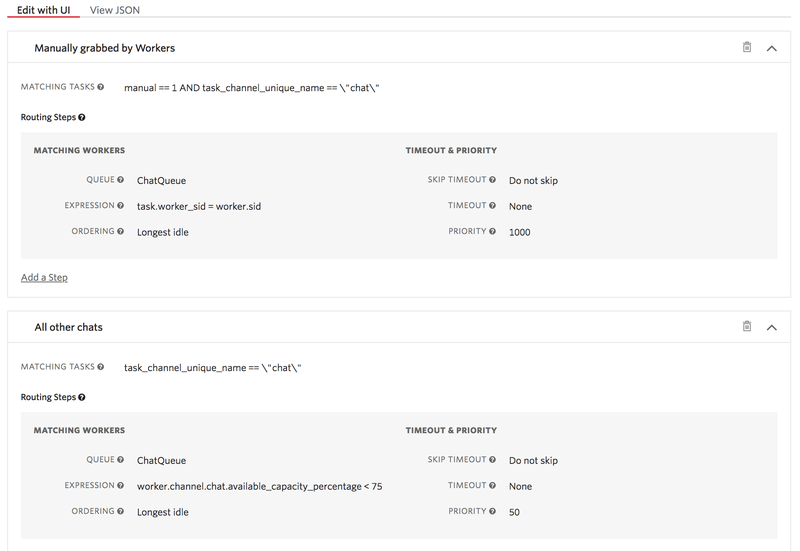 Example: If the worker is configured to handle 4 Chat Tasks and is currently assigned to 2 Chat Tasks, the worker.channel.chat.available_capacity_percentage is 50 and thus makes worker available to receive Tasks from other channels. However, if the worker is configured to handle 3 Chat Tasks is currently assigned to 2Chat Tasks, the worker.channel.chat.available_capacity_percentage is 66 and thus makes worker unavailable to receive Tasks from other channels. These are just a few use cases that demonstrate how you can use these predefined attributes in your workflow in making appropriate routing decisions for your use case. When Multitasking is enabled by default you get five TaskChannels (Voice, SMS, Chat, Video and Default). However when routing web leads, click to dials, outbound calls or emails using TaskRouter you may want have custom TaskChannels to use for these channels. As a result we are adding support for custom TaskChannels in phases so that you can add/modify/delete these channels. How do I enable Multitasking? Multitasking is a workspace level setting, and you can enable/disable by navigating to Workspace/Settings in Console or REST API. What happens if I want to temporarily disable Multitasking after I have enabled and configured my worker capacity? Once you enable Multitasking and made all the changes, if for any reason you want to disable Multitasking, simply change it from the Console. All the Capacity you’ve configured for the workers will remain when you enable Multitasking again. What are TaskChannels and how do I use them? What channels are available when Multitasking is enabled? Today we create the following channels by default. How can I create custom channel? Please stay tuned, custom channels are coming soon ... If you need one sooner, contact support@twilio.com with your use case. Why does the Worker not change activity when using Multitasking? TaskRouter cannot assign any Tasks to workers unless worker is in an available activity and since a worker needs to be able to work on multiple tasks when Multitasking is enabled, it’s important to keep the worker Idle. However, TaskRouter will keep track of the available capacity and will not assign more tasks than allowed for a worker. What happens if I put my worker to Busy when MultiTasking? This is a perfectly acceptable use case and it will immediately stop TaskRouter for assigning any new Tasks. If a worker wants to temporarily not receive any Tasks, move the worker to an unavailable activity such as Busy so that TaskRouter stops assigning Tasks. However worker can continue to work on existing Tasks and complete them. How does TaskRouter know when a channel capacity becomes available? When a worker accepts a reservation and the Task is assigned to the worker, the available capacity for the worker is decremented by 1. Once Task is moved to complete assignment status, TaskRouter automatically increments the available capacity by 1. You can move a Task to complete status by using either the REST API or using completetask() function in taskrouter JS SDK. Can I get break down of Tasks by Task Channels? This is currently not supported, but we expect to make it available soon. What kind of statistics are provided when using Multitasking? This section is dedicated to different uses cases and how you can implement them using Multitasking. Allow workers to manually grab tasks as well as be automatically assigned Tasks. Set a Worker Attribute called sid and set it’s value to the SID of the worker returned by Twilio (this will be automatically available in the future without manually setting). Display all the pending tasks in Chat Queue by using the List Tasks API and filter by Chat Queue and the task assignment status. When a worker selects a Task to work, add two new attributes to the Task. Set manual with value of 1, and worker_sid to the SID of the worker. The other piece is to control what capacity your workers have for handling automatically assigned tasks, and to ensure they still have free capacity to handle manually assigned tasks. You’ll notice that in this Target Worker Expression TaskRouter onlys creates reservation if the available capacity for the worker is < 75 (percent). This is important to keep some capacity reserved for worker so that they can manually grab Tasks. This is also the place where you can control what percent of Tasks are automatically reserved by TaskRouter Vs what is worker allowed to manually grab. For example, if the total configured capacity for a worker to handle Chat requests is 4 and you want assign up to 3 tasks by TaskRouter but allow worker to grab 1 task manually, then your Target Worker Expression will look like, worker.channel.chat.available_capacity_percentage < 75. However if you want the worker to be able to manually grab up to two tasks, and only be automatically assigned two, then the Target Workers Expression looks like, worker.channel.chat.available_capacity_percentage < 50.